The Confederate States in 1862. Licht green denotes claims made bi the Confederacy. Medium green denotes wastren coonties o Virginie that separatit frae that State an war admittit tae the Union as Wast Virginie. Teal denotes the rest o the Indian Territory that did nae sign a treaty wi the CSA. 1 Aurie an population values dae nae include Missouri an Kentucky nor the Confederate Territory o Arizona. Water area: 5.7%. 2 Slaves includit in abuin population coont (1860 Census). 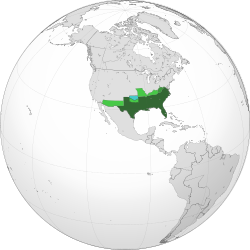 The Confederate States o Americae (CSA or C.S. ), commonly referred tae as the Confederacy, wis a confederation o secessionist American states existin frae 1861 tae 1865. It wis oreeginally formed bi seiven slave states in the Lawer Sooth region o the Unitit States whase regional economy wis maistly dependent upon agricultur, pairteecularly cotton, an a plantation seestem that relied upon the labor o African-American slaves. ↑ "Preventing Diplomatic Recognition of the Confederacy, 1861–1865". U.S. Department of State. ↑ "Industry and Economy during the Civil War". National Park Service. This page wis last eeditit on 21 Februar 2018, at 08:09.